The INCREASE scheduling control: how does it work? The Scheduling Control Agent (SCA) developed by the INCREASE team will use the flexibility of demand response (DR) in order to help mitigate problems in the low voltage network and make optimal economical dispatch of DR units. 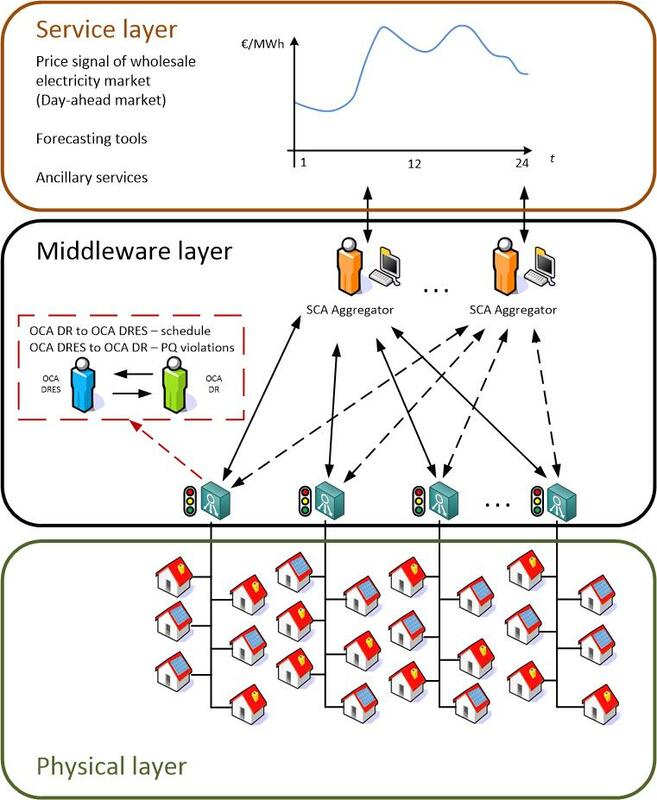 The SCA acts as an aggregator of individual DR units and provides them with an access to the price signal of the wholesale electricity market. In the process of scheduling the DR units, the SCA scheduling algorithm takes into account different parameters of DR units and dispatches them according to the set boundary conditions and the chosen objective function. In INCREASE, the Multi-Agent System (MAS) control scheme lies in the heart of the intelligent control of the PV generation and demand response units. As the top hierarchical layer of the MAS control scheme, the Scheduling Control provides the coordination of the lower level control layers, the Overlaying Control (OC) and the Local Control (LC). The layers all feature agents employing a varying degree of intelligence that control the operation of various elements of the power system. Maximize the profit of DR units. Internal DR unit energy price. For real time operation of DR units, a “traffic light system” approach is proposed that enables the DSO to approve or block the proposed DR schedules. The traffic light system employs three different modes of operational control, which differ by complexity of control and information required for its operation. DR unit schedules featuring combinations of optimization objectives and traffic light system modes will be simulated through evaluation scenarios in the INCREASE simulation platform. The simulation results will be compared and analyzed through standard and some new key performance indicators developed for this purpose. A general overview of scheduling control concept is presented in a picture below.